Located in the state of Madhya Pradesh, Kanha National Park is one of the most beautiful splendours of the state. Now a tiger reserve, Kanha National Park was established in 1955 to protect the endangered and rare species of animals and plants. It was declared a tiger reserve in the year 1973 after witnessing a decrease in number of tigers in the country. Today, it is the largest national park in central India and is visited by thousands of domestic and foreign tourists every year. The lush green beauty of the park also attracts several photographers and nature lovers who come here to frame the captivating view of its dense vegetation and diverse wildlife. Located in Madhya Pradesh, Kanha National Park is a perfect weekend getaway from Bhopal in the arms of nature. So, how about planning a trip from Bhopal to Kanha National Park this season? 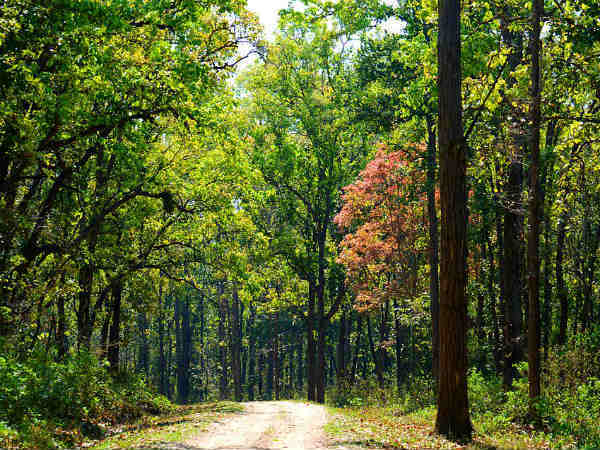 Rich in flora and fauna, Kanha National Park is a year-round destination for photographers and nature lovers. However, if you desire to witness the beauty of this wonderful park at its summit, when the park is filled with lush greenery all around and with a maximum number of animals out in the open, then the best time is from February to June. By Air: You can catch a flight to Jabalpur Airport and then from there you can hire a cab to Kanha National Park, which is situated at a distance of around 160 km. It will take you an average time of 3 hr 30 min to reach your destination from Jabalpur. By Rail: The nearest railhead is at Jabalpur. You can catch a direct train from Bhopal railway station to Jabalpur Junction and then from there you can take a cab to Kanha National Park. By Road: Kanha National Park is situated about 410 km from Bhopal and due to the good network of roads, it can be easily approached by road. You can reach your destination within 9 hours by route 1, i.e., 1 hour lesser in comparison to route 2. On your way to Kanha National Park, you can also take a break at the following places and visit their places of interest. Raisen is a beautiful town in the state of Madhya Pradesh and is famous amongst tourists for the Raisen Fort after which the town is named. Located atop a hill, Raisen Fort overlooks the core settlement of the town, which is nestled at the base of the hill. From the top of the fort, you can enjoy and capture certain panoramic views of the nearby places. Even though the fort is in ruins, it is still a place where you can learn a lot about the history of the place. If you are keen to learn about the bygone era, then how about taking a break at Raisen Fort and listening carefully to its collapsed walls narrating the legends of its survival and destruction? The lush greenery around the fort is an added bonus for you. Raisen is located at about 90 km from Bhopal and 260 km from Kanha National Park. Narsinghpur is an ancient place which is said to have been flourishing since the 2nd century. It is famous amongst local tourists for Lord Shiva and Lord Narasimha temples. Being an age-old settlement, you can also find a few small archaeological sites. The major places to visit here include Narsimha Mandir, Brahman Ghat, Tone Ghat, Damru Ghati and Jhoteshwar. You must take a break at Narsinghpur if you are looking to savour the beauty of ancient temples. It is nestled at a distance of about 230 km from Kanha National Park and 225 km from Bhopal. Kanha National Park covers an area of around 940 square kilometres and is one of the richest parts in the country. Over a period of time, the tourism in Kanha National Park has witnessed a huge increment, thereby, making it one of the major hotspots to explore in India. Eventually, after travelling a distance of about 410 km, you will be on the lands of woods, tigers and much more. Read on to know more about its flora and fauna and why you should visit this park. Covered with beautiful meadows and forests of sal and teak, Kanha National Park houses hundreds of species of animals, flowering plants, reptiles, butterflies and birds. The major species apart from tigers found here include spotted deer, barking deer, nilgai, striped hyena, sloth bear and jungle cat. The prominent species of birds include Indian roller, common teal and cattle egret. You cannot find such an amazing mix of birds, animals, flowers and forests everywhere in India. From photographing the sunrays reflecting over the tender leaves of the trees to the meadows changing their colour from dawn to dusk, each and every activity taking place inside the park is a beauty to enjoy and a delight to savour. You can also get in touch with the tribes of certain villages settled inside the buffer zone of the park. Wouldn't you love to get yourself to this world of rich biodiversity?